The month of June was extremely kind to me. Throughout the whole month I watched as all of my hard work turned into well run tournaments, exciting community outreach programs, and sponsorships that supported the U19 teams new jerseys. As I alluded to in my May blog, I had a few things I was in the midst of planning. 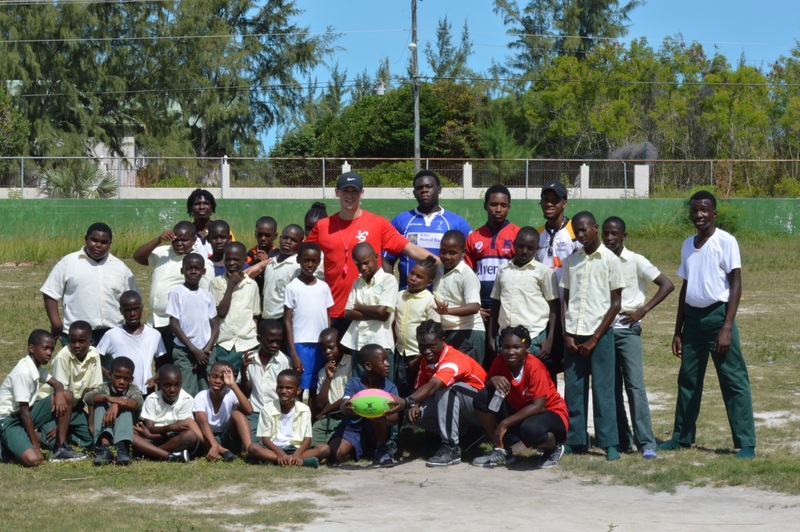 All of which manifested into events with positive outcomes that generated more rugby interest among the TCI youth. My first big event was the school clean up at Enid Capron Primary. As I mentioned before, they are one of my favorite groups of kids, the enthusiasm and joy they get out of playing rugby brings me complete joy, energy and makes the job even more fulfilling. As a token to their passion and dedication to the game, I thought that I could bring in some of the U19 players as rugby role models to help clean up their garbage infested field. So on June 15th I brought a group of 8 national U19 players and two coaches (one being myself) to the school during my usual session time with garbage bags and gloves. The kids sectioned off into groups with the players and coaches. After all 15 garbage bags were completely filled up, we gathered the students into two teams with the U19s as the captains and played a massive touch rugby game. The kids absolutely loved it! Everyone who attended, the U19 players included, had an absolute blast. Then, the next day I was in charge of coordinating the Inter High Tag Tournament. This was a project of mine that had been in the works since I landed in Provo, and so I had plenty of time to plan it out. It was a c ool experience for me as a Sport Manager because it was my first official event that I was in charge of running. I was able to use skills and techniques I learned through my schooling, all of which guided me through the process. Roughly 300 people attended, 100 of them being players from 5 different high schools. 2 of the 5 high schools were first time participants in the tournament and ironically were the winners at each age level. Wesley Methodist; a school that I would visit 4 times a week won the U15 age level of the tournament and TCIPS won the U19 age level. Some of the things that I learned through the event creation process is that as a Sport Manager you must be able to delegate tasks and volunteer roles early and efficiently; plus, you need to be prepared to put in the extra effort needed, even if it means doing a lot of the work by yourself. Generating sponsorship interest here in a developing country is very difficult. You have to be persistent and willing to visit dozens upon dozens of potential sponsors. You are chasing mainly cold calls mixed with numerous emails and in person pitches. Most places either spent their sponsorship budgets already or showed slight interest with no continuation after a follow up. But, luckily with enough persistence and dedication to finding a sponsor it will all work out, and that’s exactly what happened. 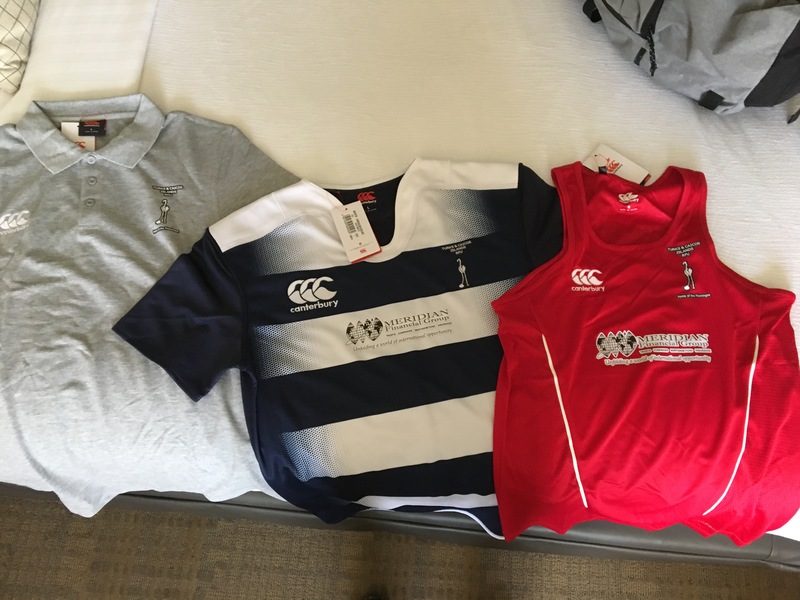 I ended up getting three sponsors which covered the cost of the jerseys and a bit more for the team! The whole process took much longer than anticipated but in the end the result was magnificent and brought the deserving bunch some brand new gear for their hard work. 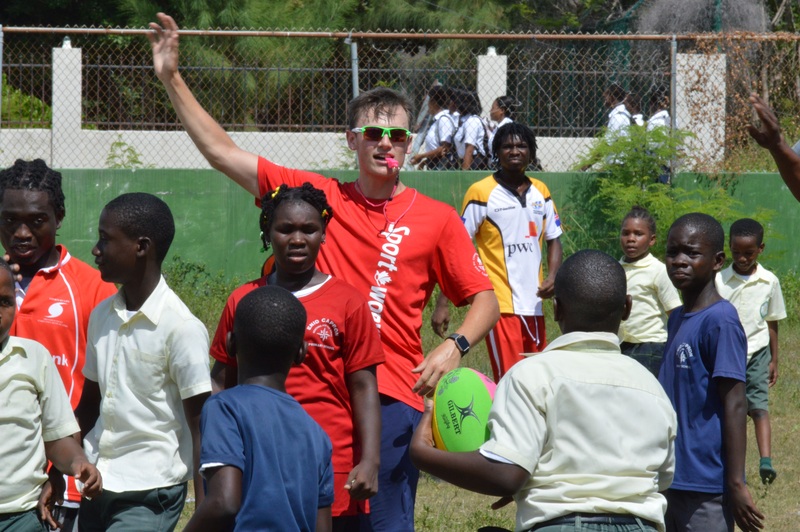 A few other events that transpired within the past month included the Beach Rugby Tournament on June 24th, where I helped serve friends and family some food and beverages. Then later that week the end of the Youth Tag Rugby League, where I was in charge of running and planning the final championship day, my tasks included; painting the lines on the field, getting all the food and beverage, ordering and picking up the trophies, refereeing, and volunteer role assignments. Aside from work, my girlfriend Courtney came down to visit me for 2 weeks. 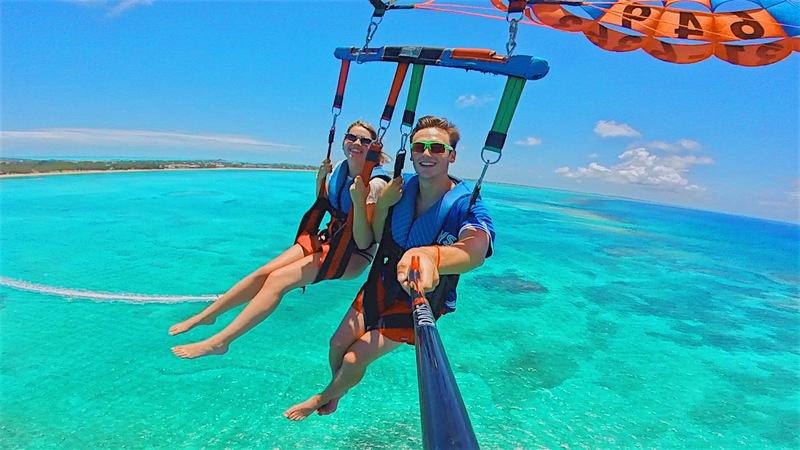 She allowed me to do a bit more touristy things like parasailing, visiting new beaches, and just plain old relaxing on the beach without a care in the world – except our sunburns. All in all, the month of June has helped me put theory into practice, and I would not trade this experience for the world. It has given me the confidence and leadership skills that I will use the rest of my life as a Sports Manager. I am excited to see what July has in store for me!